Before investing in a surveillance system, you will want to determine what it is that you are planning to watch and what is needed for you to watch the material in the first place. One of the first questions that should come to your mind is that of how many cameras you are going to need around the property. Do you need to focus on multiple areas around the property or just a single area? Are you going to need to monitor outside of the business or just on the inside? If you are simply going to watch over a single room, you can probably get away with just one camera to do the job for you. The more areas you need to monitor, the more cameras you are going to need for the property. You can choose from a wireless or wired camera for the property. The type of setup you need is going to depend upon where you are planning to place the cameras and the degree of visibility you want in the cameras. Utilizing a wired camera can be a little more difficult to install, and the stray wires can cause problems with trying to disguise your cameras from plan view. Most of the time, these cameras will provide you with a higher quality picture than their wireless counterparts because they don’t have to worry about their signal traveling throughout the air. A wireless camera can provide you with an enhanced degree of flexibility, but broadcasts that come from other devices such as that of cordless phones, wireless Internet and even baby monitors can affect the signal of the camera. You will also want to remember that if you decide to focus on a wireless security system, there is the chance that the video feed could be intercepted by others in the area. If you hire someone else to monitor the business when you are not there, it is only going against the underlying purpose of the cameras in the first place. For those who are worried about security, you will want to find out whether the camera is encrypted or not. 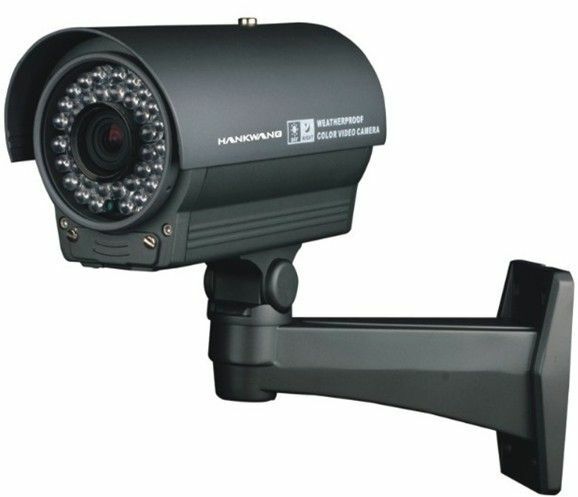 Even though a larger camera may be more visible, people will often choose to install them on the outside of the property or in areas where people are aware of the fact that they are being monitored. You also have the option of installing smaller cameras that can be hidden out of sight in a number of different forms. Before you make the decision to install security systems around your property, especially when it comes to that of the smaller ones, you will want to have a thorough understanding of the legal restrictions for using surveillance systems. In the majority of states, you will need to alert anyone who is in the vicinity that they are subject to audio and video recording when inside of your property. If someone were to find the camera without being told it was there, they could come after you for invading their privacy. It is imperative that you stay within the confines of the law at all costs when it comes to protecting your property. After you have decided the proper areas for placement of your security cameras, you will want to ensure the system is properly set up to ensure the safety of your surroundings. If the system is not properly installed, you will not get the results that you desire. If you don’t have a lot of experience with electronics, it is best left to the professionals. Make sure you are purchasing your equipment from someone with a solid reputation. Legality of your surveillance system is also imperative to protecting your assets. The majority of cameras are not complicated, so you may be able to perform the installation on your own. Based upon the specific model you purchase, the process for installation is going to vary accordingly. It is imperative that you follow the directions to ensure the proper installation of your system. The location of where you are placing your security cameras is equally important. Make sure to consider the distance from the subject to the camera to ensure the areas are visible and in focus. If you plan to mount your camera to the walls or other surrounding structures, you will need to make sure it is properly mounted to preventing any distortion in the picture from shaking. An outdoor camera will help to prevent a potential burglary from occurring in the first place, especially since they are capable of covering a large amount of space. Always make sure that any cameras placed outside of your establishment are covered in a weatherproof housing to protect your investment from the elements. Thanks to the tough casings,it will also help to prevent any potential vandalism or tampering. it will also help to prevent any potential vandalism or tampering. Determine whether you are planning to record the surveillance footage or not. If you are planning to monitor specific areas for an extended period of time, you will want to connect a recording system to your security cameras. Depending on your specific situation, you can implore the use of a VCR to record videos, but many others choose to run their whole system through their computer to help save information in a digital format. To help minimize the amount of video being wasted, you can always utilize motion detection technology that will only begin the recording when the unit detects movement within its designated range of motion. Since there are a number of options available, it is imperative that you choose the right one for your specific needs and wants. Being able to choose the right system for your business is all about knowing how you want the unit to work for your business. Since you cannot be in two places at once, you want to ensure you are getting the most you can around your business with a security system in place. Thanks to the installation of security cameras around the business, you will be able to help minimize the amount of burglaries and theft that occurs around your business. Security cameras can help to provide you with the peace of mind that you desire around the property. Video surveillance will help provide you with the means to monitor and record any activity around the area for a variety of different reasons. You can see if something is going on around the business that should not be taking place in the first place. Countless security cameras are on the market today. Some of those cameras are right out in the open, which can help to deter a criminal from making their way into your home. Other cameras are tiny and meant to remain undetected to the naked eye. Countless options can be customized to meet your specific needs and wants. Utilizing a high-definition security camera will help to ensure the entity is monitored to the fullest. In the event something were to go wrong, you would be able to look back at the video footage and determine who the perpetrator is and what they did exactly. Thanks to the technology in high-definition video recordings, you will have a clear definition of what the individual looked like without having to second guess yourself. You never can tell what is going to happen in the place of employment, but you can be prepared for the unexpected that comes your way. Preparing yourself ahead of time can help to save you a lot of hassles and headaches in the long run. When you work in a secure environment, you need to ensure the information in your business is kept confidential by those that you trust to work for you. Instead of having to wonder whether things are going to occur or not, you need to focus your time and attention on preventing them from happening in the first place. Don’t cause a tremendous amount of fear and worry when you have the option to prevent it. Look at all of the different security cameras in the marketplace today and determine which one is going to work the best for your individual wants and needs. Regardless of what it is that you desire, you are sure to find a security camera that is going to work perfectly for you. From installation to monitoring, you have the power to control the degree of surveillance you desire, as well as the features you want in your new security system. Once you have your high-definition security system in place, you will be able to rest assured that everything is being monitored fully and there is no chance that something is going to go wrong in the business. Take your time to determine how many cameras you need and where you want them located to help maximize the benefits of your security system. You will be amazed at how much of a difference the security systems can make around your business today.